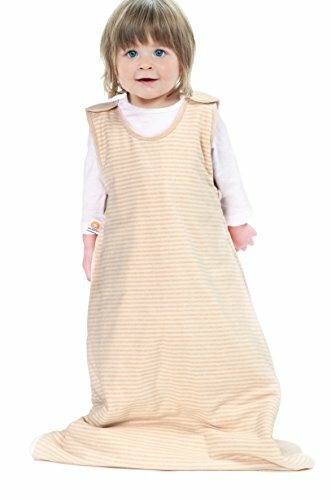 The Cotton Flower baby sleep bag is made of two layers of 100% natural cotton pin-stripe interlock fabric, with 100% pure cotton filling, grown pesticide-free and manufactured without the use of harmful chemicals. It is good for Fall, Winter and Spring. EKO-Tex 100 certified fabric(tested for harmful substances);Meets all US CPSC children safety requirements. Reduce skin allergies: Cotton is natural and breathable fiber; it does not itch your baby's skin and can be safely used with eczema or sensitive skin. Synthetic fiber does not breathe, making it more likely for your baby to perspire. It creates a moist environment which leads to a chill zone. Bacteria is more likely to survive in these conditions. Regulate baby's temperature: Cotton fiber breaths and controls humidity, which allows it to actively regulate temperature. Cotton has a natural affinity for water. It attracts moisture away from baby's body. Moisture passes freely through cotton aiding in evaporation and cooling. Cotton allows heat to dissipate, which make it a wonderful fiber to maintain a comfortable sleeping temperature. No dyeing or printing 100% Natural Cotton, grown pesticide-free and manufactured without the use of harmful chemicals. Pure cotton is natural and breathable fiber; not itch and can be safely used with eczema or sensitive skin. Innovative bottom-folding-up design for avoiding over-heating; Can leave bottom open for free movement of feet. Both shoulder snaps and full-length inverted side zipper for easy dressing, double direction zipper for easy diaper changes. Oversized fit with large armholes and a premium luxuriously-soft cotton fabric for ultimate comfort. If you have any questions about this product by Cotton Flower Baby, contact us by completing and submitting the form below. If you are looking for a specif part number, please include it with your message.